How much does it cost to build a house in Indiana with a finished basement. Thanks so much for your great web site! We recently bought “Be Your Own House Contractor” (5th ed.) and we’re sure it’s going to be very helpful when we begin to build in approximately two years. Our question has to do with cost estimating and whether we’re doing it correctly. We are using the Craftsman Building Cost Calculator found on your web site. We would like to act as our own General Contractor. We live in Indiana in the South Bend zip code range. Our property is in the country. 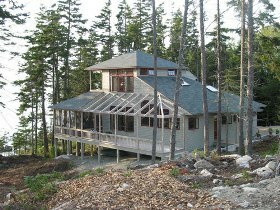 Hi Marla, I found out that this unique house was designed by R W Knight of Knight Architecture for clients who had a beautiful hillside lot that looks into a gorgeous bay in Maine. It is striking! Well Marla, let’s get started! I used 6 corners (It’s not an exact science) and “Average Standard” quality (#5) for all the “Quality Class” questions on the Craftsman construction estimating software found on my “Getting Started” page. *The living area is 1,647 square feet. *The number of stories is 2. *Basement: 1131 square feet of finished basement. *Total living area with finished basement = 2,778 sq. 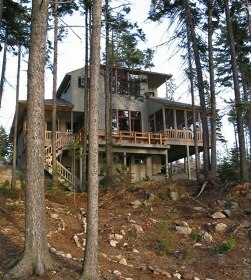 ft.
*Sloping Site: This home is built on sloping ground. The lowest point under the house looks like about 10 feet lower than the highest point. *1 insulated prefab metal fireplace, brick face. With a finished basement the cost calculator came up with an approximate total cost of $219,012 including a $25,000 General Contractor markup, which you won’t have to pay if you are the General Contractor. That lowers the approximate cost to build to $194,012, or $69.83 per sq. ft. with you as the G.C.! Again, the estimate for this house is an approximate one based on average quality materials. Until you actually start getting bids and entering them into your own spreadsheet (see my spreadsheet page for FREE spreadsheets, it will remain approximate.